Does Eating Candy Cause Violence? An unusual study released in the British Journal of Psychiatry suggests that there is a link between childhood candy consumption and adulthood violence. Simon Moore and others from the University of Cardiff followed 17,000 children for the past 40 year and discovered that those that ate candy daily as 10-year-olds were significantly more likely to be arrested for violent crimes as adults. In fact, 69 percent of the daily sugar eaters had been booked for violence by age 34! Even after accounting for sociological differences, there was still a significant link between candy and violence. So too much candy causes tooth decay, health problems, and violent crime? Wow. I just might have to pass on my daily maple syrup and bacon lollipop. As delicious as it might be, the last thing I want to do is start attacking random strangers because my decaying teeth make me too sick to work. 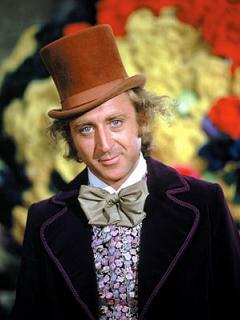 Maybe Willy Wonka was Jack the Ripper!